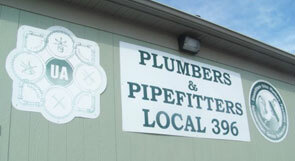 Plumbers and Pipefitters Local 396 was established in 1998, from the merger of Local 87 Youngstown and Local 225 Warren. We represent over 600 union highly trained plumbers and pipefitters who are members of the United Association of Journeymen and Apprentices of the Plumbing and Pipefitting Industry of the United States and Canada. Our training programs provide our members with the knowledge and skills required to be leaders in the Plumbing, Pipefitting and HVAC industry. Our members work on a variety of projects here in the Mahoning Valley including; Residential sites, small and large commercial jobs, hotels, apartment buildings, manufacturing plants, hospitals and healthcare facilities, schools and universities, steel mills, gas cryogenic plants, and power plants. Our apprentice and journeymen members provide contractors with a skilled and safe workforce, capable of meeting the demands of all facets of the piping industry. Our Local has remained steadfast throughout the years. Our commitment to the Valley, work ethic, and community service have proven to be an asset.